Yogyakarta – Tuesday, April 9, 2019 The Doctoral Program of the Faculty of Economics and Business of the University of Gadjah Mada held an open examination of doctoral promotions for Bagus Suripto, S.Hut., M.B.A. who is a Doctor of Management student. Dr. Bagus Suripto, M.B.A. is an employee of a State-Owned Enterprise, the Perhutani Public Company (Perum Perhutani). 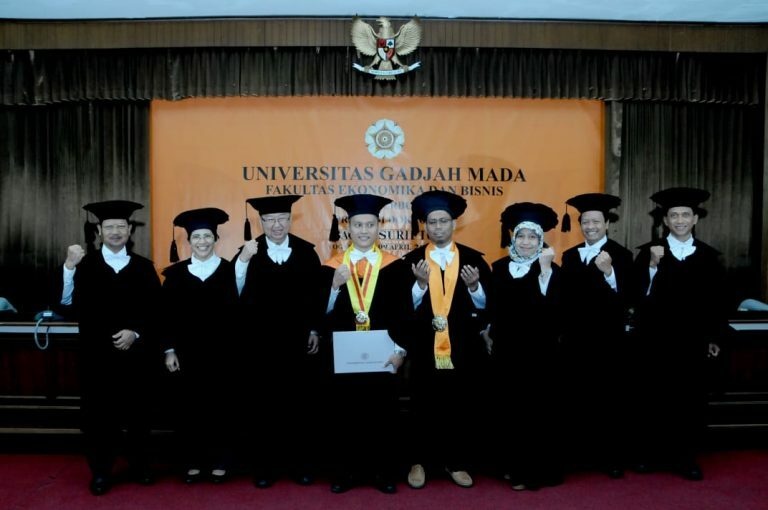 After officially holding his 4352th doctorate at Gadjah Mada University, and the 266th at the Faculty of Economics and Business, Gadjah Mada University with a dissertation entitled “Negative Group Affective Tone and Group Creativity: Collective Efficacy as a Moderator”. The doctoral promotion open examination is led and opened by the chairman of the assembly Prof. Mahfud Sholihin, M.Acc., Ph.D., along with the team of promoters namely T. Hani Handoko, MBA, Ph.D., as a promoter, Suicide Kismono, MBA, Ph.D., and Sari Sitalaksmi, M. Mgt., Ph.D. as co-promoter. In addition, there was also a testing team and assessment team, Dr. Reni Rosari, Dr. C. Budi Santoso, M.Bus., and Dr. Wisnu Prayogo, M.B.A. The promoter team, the testing team, and the assessment team asked Dr. Bagus Suripto, M.B.A. several questions. The dissertation aims to examine the positive influence of Negative Group Affective Tone (NGAT) on group creativity and empirically test the role of moderating Collective Efficacy (CE) on the positive influence of NGAT on group creativity. This dissertation uses a sample of 73 groups from 15 organizations. The questionnaire about NGAT and CE is filled by group members, while the questionnaire about group creativity is filled by group leaders. The results of the study found that NGAT had a positive effect on group creativity, but statistically the relationship was not significant. The emotional level of group members is not enough to influence the creative behavior of its members. When NGAT and CE act as independent variables, NGAT and CE have a positive effect on group creativity. Another finding was that CE was moderating the NGAT relationship with group creativity, CE was consistently able to strengthen the positive relationship between NGAT and group creativity. Open examination for doctoral promotion ends with the submission of a diploma by the chairman of the session and followed by a joint photo session.